John Simonson won a state title last season while playing in one of the nation’s most outlandishly extravagant hockey rinks. Still, the senior from Grand Forks, N.D., felt there was something missing from his resume. To remedy that, the Grand Forks Central star made sure he had the kind of Upper Midwest High School Elite Hockey League season that makes people take notice. He did. And they have. 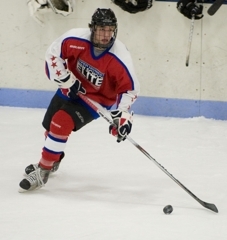 Simonson, who scored 10 goals and 10 assists in 21 games including the playoffs for Elite League playoff champion Great Plains, parlayed that consistency into a roster spot on Minnesota Red for the Bauer National Invitational Tournament. Simonson scored the winning goal and added an assist to lead Minnesota Red past the Dallas Stars 4-2 on Friday, Nov. 5, in a quarterfinal matchup at New Hope Ice Arena in New Hope. 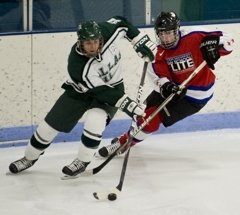 Simonson played on a line with Grand Forks Central sophomore Luke Johnson. Simonson said he and Johnson were linemates all last winter and expect to be paired together again this high school season. 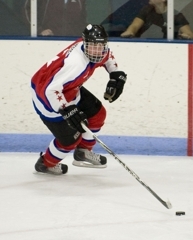 Simonson scored 43 points (14 goals, 29 assists) in 43 games for the Knights last season. “Hopefully I can pick up my team and my teammates and have a good season there, too,” Simonson said about returning to Central for the high school season. Thomas Schutt isn’t sure how it happened. Or why. But somewhere, somehow he became known as a defensive specialist. 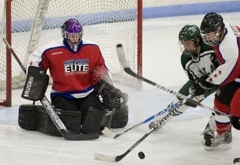 Schutt only built on his reputation as defensive stopper with his performance in Minnesota Red’s 4-2 Bauer National Invitational Tournament triumph over the Dallas Stars. While he didn’t’ crack the scoresheet, Schutt played center on a line with Edina’s Steven Fogarty and Bloomington Jefferson’s Eric Freschi. Those three were effective in limiting the Stars’ scoring chances, as were the rest of Minnesota Red’s players, especially during 5-on-5 play. Both of Dallas’ goals came on power plays. The 6-foot, 180-pound Schutt, who scored eight goals and added 10 assists in 24 Elite League games this fall including the league playoffs, is expected to put up big offensive numbers for Minnetonka this season. No doubt Division I scouts will be watching closely. Schutt said has taken unofficial visits to Colorado College and the University of North Dakota, where his brother, Steven, is a senior. “It’s nothing big, but it’s nice to talk to the coaches and stuff,” Schutt said about checking out the two WCHA programs. The senior forward from Grand Forks Central (N.D.) scored the game-winning goal and notched an assist while playing on a potent line that included Grand Forks Central teammate Luke Johnson and Roseau’s Shane Omdahl. A junior from Arlington, Texas, Frey (pictured below) made 19 of his 47 saves in the first period to keep Dallas from getting blown out early. He came on strong again in the third period when Minnesota Red unloaded 15 shots, including several from point-blank range. Omdahl, the savvy senior forward from Roseau, scored a goal, notched an assist and was involved in several near-miss scoring chances. Standing out among all the Texas- and Oklahoma-born players on the Dallas Stars roster was a Waseca native Blake Malecha. 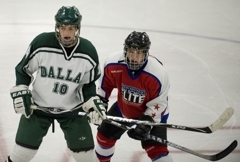 A senior forward, Malecha did not break onto the scoresheet in the Stars’ 4-2 loss to Minnesota Red on Friday night. “I’m sure he had a lot of family and friends here tonight,” Stars coach Adam Robbins said. 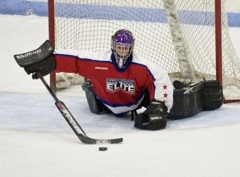 Robbins said Malecha made the initial contact about the possibility of playing for the Stars. “It seems like we’ve had one Minnesota player on our roster just about every year,” Robbins said. … Listed among the Dallas Stars’ coaching staff is Craig Ludwig, a familiar name to longtime college and NHL fans. Ludwig, a punishing defenseman from Rhinelander, Wis., played at the University of North Dakota and had a lengthy NHL career that included a stop with the Minnesota North Stars before the franchise moved to Dallas. 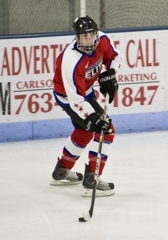 … Missing from the Minnesota Red lineup was high school preseason Mr. Hockey favorite Kyle Rau of Eden Prairie. Rau initially was named to the Minnesota Red roster as a full-time player before being switched to an alternate. He reportedly is nursing an ankle injury. … The “Minnesota” part of Minnesota Red is somewhat misleading, given that there are six players from Wisconsin and three from North Dakota on the roster. 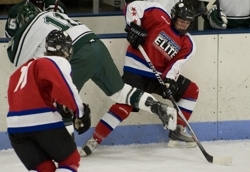 Minnesota Red was comprised of players from four teams in the Upper Midwest High School Elite Hockey League, including Team Wisconsin and Team Great Plains, which is a mixture of North Dakota and northwest Minnesota players. John Simonson, a senior from Grand Forks Central (N.D.), scored the game-winning goal with 7 minutes, 20 seconds left in the second period as Minnesota Red held off the Dallas Stars 4-2 on Friday, Nov. 5, in the quarterfinals of the Bauer National Invitational Tournament at New Hope Ice Arena in New Hope. Simonson, playing on a line with Grand Forks Central teammate Luke Johnson, a sophomore, and Roseau senior Shane Omdahl, also had an assist for Minnesota Red, which advances to a semifinal matchup against Minnesota White at 1 p.m. on Saturday, Nov. 6, in New Hope. 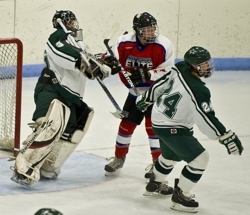 Minnesota White beat Northwood School (N.Y.) 8-1 in a quarterfinal matchup Friday. Power-play goals by Simon Leahy of Milwaukee University School and Omdahl gave Minnesota Red a 2-0 lead after a dominating opening period that saw Minnesota Red outshoot Dallas 21-4. But the Stars roared back in the second period, getting power play goals from Sam Johnson and Trace Redmond in a span of 3 minute, 39 seconds. 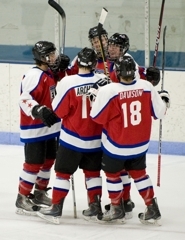 Minnesota Red got a goal from defenseman Cliff Watson of Appleton United in the third period. Dallas, playing its 14th game of the season, went 2-for-8 on the power play while Minnesota Red, which hadn’t even held a practice before Friday’s game, went 2-for-6. 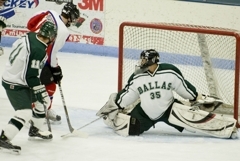 Minnesota Red goaltender Saxton Soley of Eau Claire Memorial finished with 29 saves while Dallas Stars goaltender Christian Frey had 47 saves.